My second “must-read” paper is a recent one. Unlike the last paper I discussed, I suspect that most of you have not read this one and probably don’t even know about it. I hope this post will convince you to go out and read it. And if you do, you might also use this paper in your teaching. It should be a terrific paper to explain or discuss in all sorts of courses from an undergrad evolution course filled with pre-meds to a graduate-level seminar on … well, almost anything, from genomics and molecular evolution to Darwinian medicine and evolution in action. Lieberman TD, Michel JB, Aingaran M, Potter-Bynoe G, Roux D, Davis MR, Skurnik D, Leiby N, LiPuma JJ, Goldberg JB, McAdam AJ, Priebe GP, Kishony R. 2011. Parallel bacterial evolution within multiple patients identifies candidate pathogenicity genes. Nature Genetics 43, 1275-1280. There was also an accompanying News and Views piece by yours truly. Lenski RE. 2011. Chance and necessity in the evolution of a bacterial pathogen. Nature Genetics 43, 1174-1176. Short summary: This paper provides a striking demonstration of the power of combining genomic, epidemiological, and evolutionary data and analyses. Tami Lieberman and Jean-Baptiste Michel, two graduate students in Roy Kishony’s group, and colleagues sequenced 112 clonal isolates of an opportunistic pathogen, Burkholderia dolosa, that were sampled from 14 patients over the course of 16 years. Using phylogenomics, they first traced the history of transmission events and used the resulting phylogeny to distinguish between mutations that were shared by descent and those that arose within a particular patient. They then identified 17 genes that exhibited significant signatures of parallel evolution, and they inferred that mutations in those genes contributed to the pathogen’s adaptation to the host environment. Some additional context and findings: The patients in this study were individuals with cystic fibrosis (CF), an inherited disease that makes them vulnerable to chronic and life-threatening infections of the lungs. A number of different bacterial strains can cause these opportunistic infections, and they are sometimes transmitted between CF patients in the same clinic or other settings. In the 1990s, there was an outbreak of B. dolosa infections among 39 CF patients in Boston. Foresighted clinicians and researchers saved isolates from these patients, and some of the isolates were then sequenced and analyzed in this study. The genes that Lieberman et al. identified as having mutations under positive selection in the CF host environment include several likely candidates, specifically genes related to therapeutic interventions (antibiotic resistance) and host immune responses (cell-surface antigens). However, the genes with mutations under positive selection also included others not previously known to play a role in these infections, including some involved in oxygen-dependent regulation and others of unknown function. The evidence for positive selection based on parallel evolution was further supported in two additional ways. For two phenotypes (antibiotic resistance and antigenicity) that can be readily scored in the lab, genome-wide association tests provided compelling evidence of a causal connection between specific mutations and phenotypic differences among isolates. More generally, the dN/dS ratio – reflecting the relative rates of change at non-synonymous and synonymous sites in protein-coding sequences – was substantially elevated (above unity) in the 17 genes identified on the basis of parallel changes, but that ratio was not elevated in the remainder of the genome. Why I like this paper so much: First, this paper shows just how important evolutionary thinking is becoming to fields like genomics and medicine. Remember how dreary those early genome papers became after the novelty of seeing foldout figures with giant circles (or lines, for those of you working on eukaryotes), funny colors, and tiny labels had worn off? Sure, there was phylogenetic information to be gleaned, and maybe some hints about something interesting that happened in one lineage or another. But if history is “just one damned thing after another”, then genomics was looking like “just one damned nucleotide after another.” The paper by Lieberman et al., by contrast, shows the beauty and power of evolutionary thinking when applied to an interesting collection of genomes. This study shows how a rigorous evolutionary analysis can generate new insights and new leads with respect to mechanisms of pathogenesis and potential targets of therapy. Second, this paper provides a wonderful illustration of just how far science and technology have come. It was four decades from Watson and Crick’s elucidation of the structure of DNA in 1953 to the publication of the first bacterial genome sequence in 1995, undoubtedly at great expense. Now, even a basic-science, curiosity-driven lab like mine can afford to sequence dozens of bacterial genomes to study the dynamics of evolution and the complex genetic basis of a novel phenotype. And when it comes to health-related and other applied research, advances are no longer limited by the costs of obtaining complete genome sequences of many samples, but rather by the ingenuity of scientists in analyzing, interpreting, and understanding the data. The huge advances in computing power in recent decades were also essential for this study; for example, the authors generated the null distribution for genetic parallelism by randomizing, 1000 times over, the placement of the 561 independent mutations seen in their data across the ~6.4 million sites in the B. dolosa genome. Third, I am fascinated by the tension between “chance and necessity” – randomness and repeatability – in evolution. Understanding the cause of that tension was the point of Luria and Delbruck’s paper; exploring the effects of that tension lies at the heart of our long-term evolution experiment; and exploiting that tension provides the power behind the inferences in the study by Lieberman et al. Fourth, the senior (last) author on the paper, Roy Kishony, visited my lab for a few days to discuss evolution when he was a graduate student making the transition from physics to biology. Roy has gone on to do beautiful work, both basic and applied, in the area of microbial evolution. Last, but not least, I use Lieberman et al. as a discussion paper in a course that I co-teach on “Integrative Microbial Biology.” Most of the students are in their first semester of graduate school, and they are interested in different areas of microbiology – from infectious disease and immunology through genetics and molecular biology to ecology and evolution. This paper interests all of them and, more importantly, it helps them to see how these different fields of inquiry can and do fit together. The figure above comes from Lieberman et al., 2011, Nature Genetics; it is shown here under the doctrine of fair use. 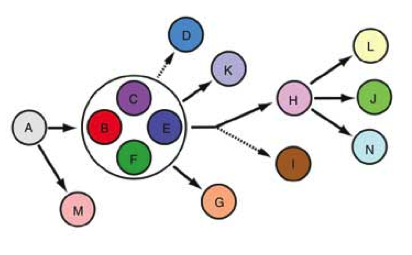 The figure illustrates the transmission history inferred from the authors’ phylogenomic analysis of B. dolosa isolates from 14 infected patients. One question, a tangential one from an ecologist tentatively considering dipping a toe into experimental evolution. You note that sequencing has become much cheaper. But balanced against that, don’t you think that readers (including reviewers and editors) now expect correspondingly more sequencing from authors? Yes, labs like yours can sequence whole genomes now, even many of them. But if you didn’t do that (if, say, you restricted yourself to only sequencing candidate genes or something), wouldn’t a lot of readers wonder why not? (My pet hypothesis is that the amount of money readers expect an author to spend on sequencing is constant, so that as the cost of sequencing drops, the amount of sequencing authors are expected to do increases proportionally). Excellent question, Jeremy. Short answer: Yes, I think purely phenotypic studies are still reasonable, provided one can make the case that the changes are heritable (to whatever degree the appropriate experiments support). Indeed, for the first decade or so of the LTEE, that’s all we had! Longer answer: I used to get annoyed by reviewers who would say: “I need to know what genes have changed before this paper is acceptable for publication,” without explaining why naming the genes mattered for our particular inferences. And identifying the mutated genes was not easy in those days, given the fact that we were observing subtle changes in an an asexual organism where most genetic tools and analyses were based on discrete (+/-) phenotypes. Sure, knowing the genes is nice, and I’ve been blessed with wonderful colleagues — most notably Dominique Schneider (Grenoble, France) — who had keen insights into where to look before whole-genome sequencing was available and affordable. But phenotypes — including fitness! — do matter in evolution, as you know. So come on into the experimental-evolution sea. The water is warm, and the sharks … the sharks … well, do watch out for the sharks!